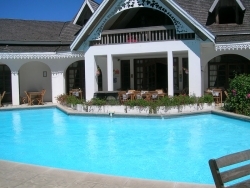 Next to the center of the village of Cilaos Le Vieux Cep is a gorgeous and typically Réunion Island establishment, located in the heart of a family estate. The warm greetings and the authentic Creole atmosphere of place are delightful. Le Vieux Cep is an ideal starting point for hikes in the Cilaos. 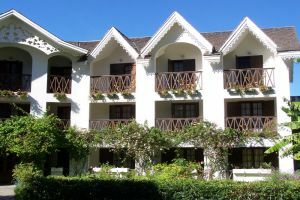 Carefully decorated, the comfortable rooms offer a breathtaking view of the ‘Piton des neiges’ and the village of Cilaos. 21 Superior Rooms: Decorated with care the rooms are very comfortable and are all equipped with a bathroom with tub, toilet, hairdryer, telephone, flat screen television with satellite TV channel, wood furniture and heater. 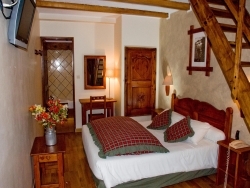 The rooms may accommodate 2 adults and 1 child. 24 Standard Rooms: Well-decorated and equipped with toilet, bathroom with tub, telephone, flat screen television with satellite TV channels, heater and terrace offering a stunning view of the garden & the surrounding mountains. 3 of the rooms are reserved for disabled person. 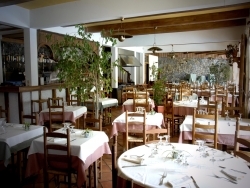 The restaurant offers a copious menu with its traditional courses in a warm & familial atmosphere. A continental buffet is served for breakfast from 07:00am to 10:00 am. They offer a wide choice of Creole specialties and also offer a cuisine with full local specialties of Cilaos.